With spring in full bloom this past weekend, I wanted to share a recipe featuring the seasonal produce we are about to see in bounty at the local farmers markets - locavores wait in eager anticipation as the root vegetables and leafy greens give way to spring onions, artichokes, asparagus, and peas. I chose this Penne with Asparagus, Sage and Peas recipe, inspired by Huffington Posts's Fresh and Flavorful Spring Pasta Recipes. The key to this recipe is finding fresh veggies as the dish is designed to feature them; consequently the sauce is very mild. Although subtle, the white wine-vegetable broth combination is flavorful and hearty, and eliminates the need for heavy cream or butter to create richness. Another secret ingredient is the sage, which provides a wonderful earthy tone against the sweet asparagus and peas. 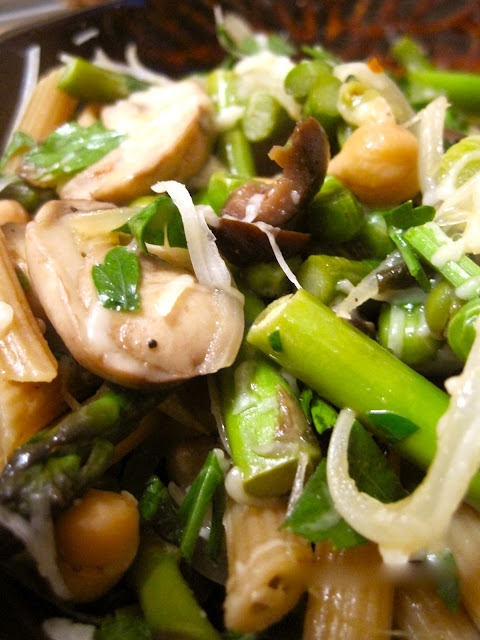 This recipe can be treated like a primavera, so feel free to use whatever vegetables you want: I added mushrooms, onions and olives to mine too. Of course, I used whole wheat pasta, and added in chickpeas for a protein boost. Cannellini beans would taste great too. Finish with a generous sprinkle of chopped parsley and Parmigiano-Reggiano cheese, and you can almost taste the blooming flowers and budding trees in the first bite. 1. Bring a large pot of water to a boil. Add the penne and cook, stirring occasionally, until al dente. (this is very important because the pasta will finish cooking in the pan.) Drain. 2. Meanwhile, in a large skillet, heat the olive oil. Add the garlic and onion/shallot and cook for 3 minutes. Add asparagus and all other optional vegetables except the peas and cook over moderately low heat, stirring occasionally, until vegetables are tender, about 5 minutes. Add the wine, peas and beans and increase heat to medium-high and simmer until liquid is reduced to a glaze, about 3 minutes. Add broth and bring to a simmer. 3. Add the pasta to the skillet and cook over low heat with the vegetables, stirring frequently with the top off, until the sauce has reduced; about 3 minutes. 4. Toss with salt & pepper to taste, grated cheese, parsley, and hot red pepper flakes (if desired). Serve immediately with extra cheese for sprinkling on the side.